The resistors are mounted with one of five orientations. The first four are the "hairpin" style, where the body of the resistor is snugged up against the board at the location indicated by the silkscreened circle and the other lead is bent into a hairpin shape and inserted into the hole pointed to by the small line on the resistor's silkscreened circle. Hairpin resistor orientations are described in "to-from" terms, indicating the direction the hairpin is pointing in relation to the resistor's silkscreened circle. For example, "east west" means the resistor is mounted hairpin style with the hirpin lead to the west (left) of the body. The fifth resistor orientation is "flat" ("flat-h" being horizontal and "flat-v" being vertical, with respect to the top edge of the board). 20 would indicate a 22 pF capacitor. Lightly snug each capacitor as close to the board as the lead formation will allow. Slightly spread the capacitor leads on the bottom side of the board and solder one lead to hold the capacitor in position. Cut both leads flush to the bottom of the board and solder the second capacitor lead. Most of the kits use both types. Do not get them mixed up! All SMT capacitor locations on Softrock kit boards are to be filled with 1206 size capacitors. You want to do your work on a cookie sheet or other "pan" with sides so, if you accidentally sneeze or otherwise "launch" one of these tiny chips, you may still have a chance of retrieving it. Most SMT components are supplied on a "cut tape" carrier strip from a reel of parts. This tape is normally a paper or plastic backing with a clear plastic strip on top. Tony marks the 0.1 µF strip with a black stripe for identification. Add a little solder to one pad and tack one end of a capacitor to a pad. Reheat and position the capacitor with the tip of the soldering iron and a toothpick. When the capacitor is properly positioned on its pads, solder the other end with enough solder to make a small fillet between the end of the capacitor and the pad. < Reheat the first end of the capacitor and add a little solder, if necessary, to make a small fillet at the tacked down end of the capacitor. Excess solder may be removed with solder wick. Leonard KC0WOX has an excellent video on installing SMT Caps. Dissipate static electricity before handling any system components (PC cards, memory modules) by touching a grounded metal object, such as the recommended uncoated metal cookie sheet. Always hold a PC card or memory module by its edges. Avoid touching the contacts and components on the ICs. Orient the IC on its pads so that the pin 1 corner of the IC matches the small 1 (it also looks like a 0) mark in the copper on the bottom side of the board. In general, pin 1 of an SOIC packaged IC is in the lower left corner of the package when the printing on the package top reads upright, from left to right. Tack-solder one corner pin of an IC and reheat the tacked pin as necessary to line up the IC on its pads properly. Check the orientation of the IC and the line up of the IC on its pads with magnification and good lighting. If all is well, carefully solder the rest of the leads to their pads. Carefully and closely inspect the pins to look for bridges caused by excessive solder or debris on or around the pads. Use solder wick to remove any excess solder or solder bridges between IC pins. Using high (3x or better) magnification, carefully check each pad and solder joint. Leonard KC0WOX has an excellent video on installing surface mount ICs. The Sparkfun website also has some good video materials on soldering and wicking SMT ICs. Inductors in the Softrock kits are generally wound by the builder on one of two different types of magnetic cores: Toroids or "Binoculars". If your kit calls for two different types of BN-*-2402 cores, take great care in keeping them separate and marked. The Softrock kits will always - in such case - provide the cores in separate, marked bags. DO NOT MIX THEM UP! It is highly recommended to "debur" the holes on the binocular cores to allow for smooth insertion of the wires and avoid inadvertent shorts caused by rough edges to the holes. This can be done using a drill bit that just fits into the holes and "twirling" it between your fingers. Better still (as suggested by Iain,MW0XEN) use a mounted stone from a Dremel type tool (just held in your fingers - not powered). This leaves a very nice rounded edge to the holes. Winding specifications provide the information on the number of windings, the role (e.g., primary or secondary) for each winding on a transformer, and the length and type of wire for the windings. 5.0 uH 17T bifilar/34T #30 on T30-2 (red) (19"). You will need two 19" lengths of #30 wire. For toroids, one turn is a single pass through the center hole. For binocular cores, one turn is a pass in which the wire goes in the bottom, comes out the top, goes back in the other hole at the top, and comes out the other hole at the bottom. The transformer will have a single, 34 turn, secondary winding of 19" of #30 wire. Usually the single winiding is wound onto the core first. Winding should be evenly spaced and ideally cover all but a 15 degree "wedge" of the toroid. Sometimes, it may be necessary to wind over the top of existing turns where there is more wire than there is bare core left. The transformer will have two primary windings each of 17 turns of #30 wire. The term "bifilar" means to take one of the two lengths of wire, bend it at the half-point so the resultant "hairpin" is composed of the two 9.5" long halves, and then twist the two strands together to make a "bifilar" strand with approximately 3 twists to the inch. The bifilar windings are usually wound AFTER (and over) the single strand winding. You should wait until you have wound it correctly before cutting the "hairpin" end of the bifilar strand. The inductance value is provided primarily to help validate the number of turns. It is the inductance of the single-strand winding. Sometimes the various wires in the kit may be of different colors. Attach no significance to the color; recognize that when the spec calls for a #nn wire, that the "nn" is the gauge of the wire and the higher the gauge number, the thinner the wire. See the sections below for further details on winding Toroidal and Binocular inductors. Toroids are used in single-winding coils and multi-winding transformers. In either case, the number of turns must be counted. Any pass through the center of the Toroid is counted as a "turn" (see below). The winding of a single-winding toroidal inductor is fairly straight-forward. Each pass through the center counts as a turn. The windings should be spaced evenly around the circumfrence of the toroid, ideally leaving about a 15 degree "wedge" between the beginning and ending of the winding. The image below is of a 22 turn coil wound on a toroid. Occasionally, you may find that there is not enough room on the toroid to place all of the windings without having to go back and add a layer of winding. Tony Parks suggests that you overlap some turns as you put on windings around the circumference of the core so that all turns are on the core by the time you get back to the start end of the winding. This should have negligible effect on the coil's performance in the radio. Alan Wolke, W2AEW has a very helpful 8 minute video on Youtube, showing his clever technique for winding toroidal coils using a "sawed-off" chopstick. Leonard, KC0WOX, also has an excellent (if large - 183 Mb!) video showing the winding of a 26 turn coil on a T-37 core. While the turns andcore size in the video are not used in any of the Softrock kits, the technique is essentially the same. The actual process of winding the core begins at about 8.5 minutes into the video. Winding toroidal transformers usually involves 2 to 3 windings on the same core. The most common is a transformer with a single winding (primary or secondary) over which two "bifilar" windings are superimposed (two secondaries or primaries). See the Toroid Winding Hints from the Experts for good tips on how to wind a toroidal transformer. In general the transformer outlines on the circuit boards, 4 hole or 6 hole patterns, correspond to the shape of the core involved. The silkscreen lines between opposing hole pairs correspond to the connections for one winding. All that is needed is to connect the leads from one side of the core, or one hole of the core in the case of the binocular cores, to the holes on one side of the pattern the the leads from the other side of the core, or other hole of a binocular core, to the holes on the other side of the pattern. Secondary and primary leads need to be sorted out properly. To mount the transformer you insert the leads into the holes annotated on the board as "P", "S1", and "S2". The holes may also be annotated as to the "row" ("a" row or "b" row) which corresponds to the leads on the "a" side or the "b" side of the toroid. After inserting the leads, the builder should pull each lead pair through the holesuntil the transformer is snug to the board. Soldering the leads completes the process. Leonard, KC0WOX, has an excellent (large - 100+ Mb!) video showing the winding and mounting of a bifilar transformer on an earlier Softrock (transceiver) kit. He also has a 2 minute video clarifying how bifilar transformers are mounted on Softrock boards. Winding and Installing transformers on binocular cores is a hard process to clearly describe. There are two aspects to it. with some leads coming out of one end and some coming out of the other. All Tony's kits - so far - have used the winding convention where all windings come out of one end of the binocular core, with one turn counted each time the wire goes in one hole and comes out the other, at the same end (see below). The other aspect is the correct polarity. That is a little easier, since Tony has designed the boards such that the polarity is pretty well handled for you. The key is to start each winding in the same hole of the bino core and end each winding in the other hole (on the same end of the core). When you finish winding the typical bino transformer with one single wire winding and one bifilar (i.e., twisted pair of wires) wire winding (yielding two windings), you have three wires coming out of each hole on the same end of the core, corresponding to the leads of the three windings. You should carefully strip the insulation from the leads (up to within an eighth of an inck of the core) and tin the leads. Sandpaper can be used to strip the insulation, or you can use an Exacto kinfe to scrape it off. Note that the insulation on the wire Tony provides is normally the heat-strippable type (which you can strip by repeatedly pulling the wire end through a HOT solder blob on the iron tip).. In most of Tony's kits the core is mounted "standing up" vertically and the windings' lead pairs are inserted into the holes corresponding to the winding. For example, if you wind a transformer with one primary (P) and two secondary windings (S1 and S2), you end up with three leads (Pa, S1a and S2a) coming out of one hole and three leads (Pb, S1b, and S2b) coming out of the other hole. The board layout in the enhanced builders notes will usually have annotations on the six holes (for a common transformer) that indicate the lead pairs for the primary, and each of the 2 secondaries. four secondary leads (S1a, S2a, S1b, S2a). 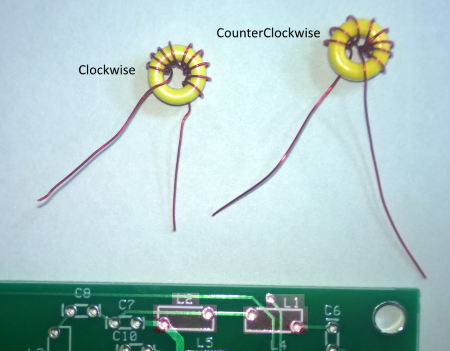 You should use an ohmmeter to identify each winding pair. Then slip a 1/8" pice of hookup wire insulation onto the Pa and Pb leads to temporarily provide identification of the primary. Also slip a 1/8" piece of insulation onto the S1a and S1b leads to act as a "spacer for the actual mounting. the core hole from which the Pb lead exits is aligned with the P hole on the bottom row. Then insert those primary leads into their corresponding holes. Then take the first pair of S leads (e.g., S1a and S1b) and similarly align with and insert into the "S1" holes (S1a on the top and S1v on the bottom row of holes in the graphic above). Finally do the same thing with the remaining lead pair (S2a and S2b). Solder all leads and you're ready to test them.